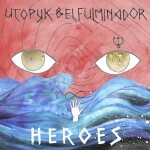 Heroes is a new release by Utopyk & El Fulminador. The original version, an alternative Pop Rock song with a gentle beat and 80s reminiscences, has been taken from the album “2011“ released recently by the duo on Fulmen Records. This EP also contains 4 previously unreleased versions, remixed by Rayo, The Imperishables and El Fulminador. All of them follow the original tempo of the track at 90 BPM, however taking it to alternative Electro-Acoustic reinterpretations (Rayo Remix), dark melodic Slo Mo (El Fulminador) and the powerful gritty sound created by The Imperishables. Original version composed by Tarmac & El Fulminador. Tracks 02 and 05 remixed by El Fulminador. Track 03 remixed by Rayo. Additional guitars on track 03 by Arsen De Mont. Track 04 remixed by The Imperishables.